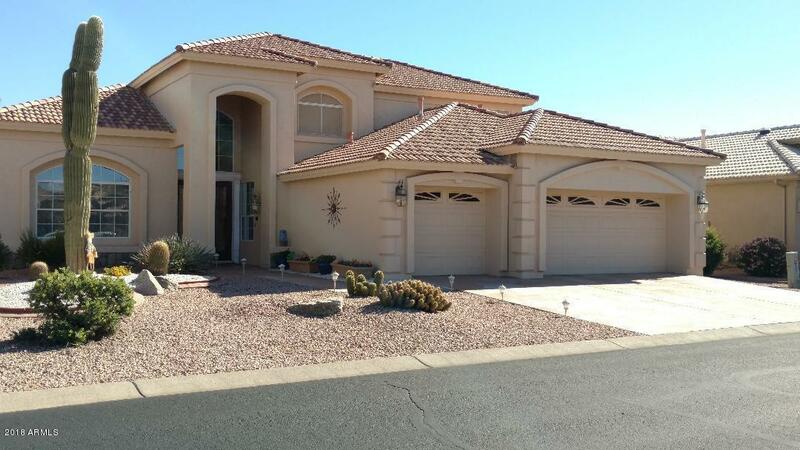 This gorgeous home, in the beautiful gated subdivision of Oakwood, is located on the 4th Green of the Sonoran Golf Course. What incredible views! Three bedrooms plus a den. Master and den are downstairs. Two secondary bedrooms with Jack & Jill bathroom and walk in closets upstairs.This home has everything! Beautifully updated and ready to move in. Spacious rooms, raised ceilings, amazing kitchen with an extra large island and what a view!!! This home was built with an attic! Gas furnace and hot water heater with gas stub to the stove and dryer. A/C units replaced in 2017. Lots of storage! Enjoy all that Sun Lakes has to offer! Golf, Tennis, Swimming, Restaurants, Lounges, Groups, Clubs and Organizations too many to list here!This is more than a home, this is a lifestyle! Welcome Home! !